The reclamation of peatswamps should be multidisciplinary but in practice this is often not the case. The data collection and research described in previous chapters dealing with the formation, characteristics, classification and agricultural potential of peatswamps is carried out by biologists, chemists, geographers and pedologists. The reclamation of peatswamps, however, traditionally involves civil and/or technical engineers and hydrologists. The agricultural activities following and accompanying reclamation are then again in the sphere of the agricultural scientists. Last but not least it is the farmer who takes decisions at farm level and often, particularly in developing countries, carries the burden of the initial efforts in swamp reclamation. The constraints in reclaiming peatswamps are therefore often experienced by those who are least scientifically equipped to understand the nature and cause of the problems. It is the nature and case of reclamation problems that are discussed in this chapter and frequent reference is made to the background information given in Chapters 1-6. For practical reasons, the problems involved in the reclamation of peatswamps are divided into: temporary, mainly the initial problems of land clearing and land preparation, and permanent or recurring problems. These can be subdivided into social and technical problems of land and water management, and agronomic problems related to cropping. This chapter is devoted more to the recurrent or permanent constraints which are very difficult or impossible to remedy, rather than to the initial temporary problems which are often of a technical or economical nature and more easy to overcome. Emphasis is on the permanent constraints of a social and technical nature, whereas problems related to cropping will be specifically dealt with in Chapter 8. Commonly the first phase of reclamation is drainage to reduce the periods of waterlogging and hence improve the soil bearing strength. This is necessary to improve accessibility, particularly if heavy equipment is to be used in the subsequent provision of access roads, land clearance, installation of major drainage canals and land preparation. Although the present day reclamation of peats in temperate regions utilizes machinery, in tropical areas it is still often very difficult to get heavy equipment to peatswamps. Here most operations, particularly the initial ones, have to be carried out by hand. Irrespective of whether the initial drainage is done by machine or hand, the nature of the peat and the vegetation it carries are the main problems to be taken into account. If the peat is very woody, operations will be slow and costly. In the lowland peat of Borneo, woody peat (with large undecomposed logs) took 10 times the amount of labour to dig drains than relatively non-woody peat (Plate 3). It is therefore important to know the content, nature and depths of any woody components prior to starting reclamation (Chapter 6, Initial survey). The initial installation of drains at strategic positions allows access for equipment either by temporary road or narrow gauge railway. 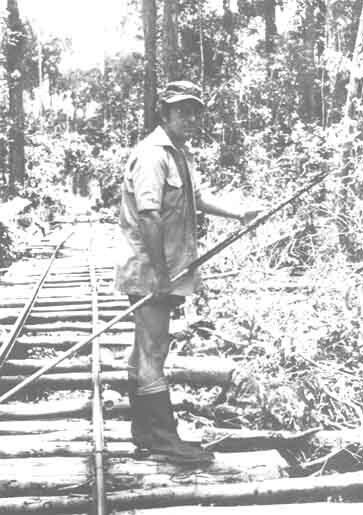 The latter is often also used for timber extraction in tropical lowland peats without the provision of any land drainage. Because of this flexibility in use, it can be installed relatively quickly and cheaply, where it is most needed (Plate 4). Peat has a low to very low surface bearing strength of between 0 and 40 kPa. This is too low for even light modern farm machinery which has a ground pressure of about 50 kPa. Lighter machines bog down because of high rolling resistance and slip. An alternative to narrow gauge rail tracks are roads with a raft base. 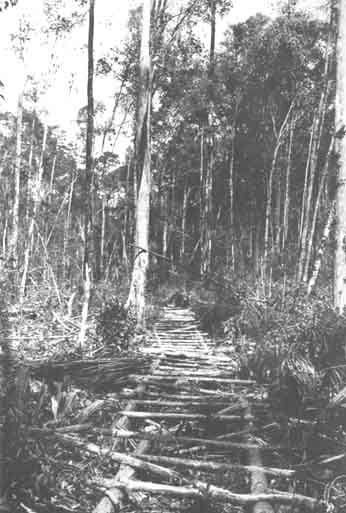 Thick branches or small logs laid side by side on the low hummocky relief of the peat surface provide a buoyant base on which an earth track can be established. These provisional paths are often important in any initial reclamation by providing access for both labour and equipment. Without a raft base, dumping earth onto peat has little effect, particularly if mineral subsoil is only found at considerable depth. Roads constructed without such rafts will be short-lived and can disappear overnight because of sinking. Within the framework of this Bulletin it is neither possible to give detailed designs for structural works in peatswamps, nor is it the intention to give engineering specifications for the required drainage layout, beyond some general information of practical importance. As this chapter discusses problems of reclamation, routine water control measures are dealt with in Chapter 8. Some remarks should however be made on specific problems of making ditches in organic materials. Ditches in peat soils erode rapidly when the velocity of drainage water is greater than about 1.50 m per second. This value varies slightly depending on the nature of peat; fibric materials behaving differently from more sapric materials. Unfortunately there are no values for tropical peats. Gradients of ditches for gravity drainage should not be over 3 , again this value has not been checked empirically. Erosion of ditch sides can be a severe problem. They preferably should be of a 1:1 design to enhance stability. 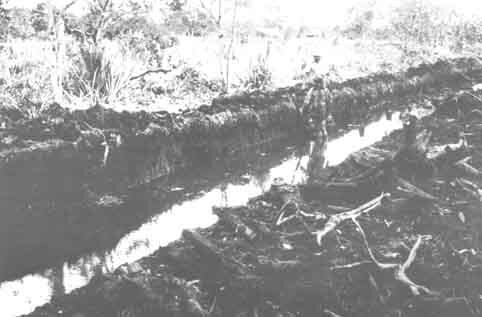 But again the nature of the peat and size of the canal or ditch are important parameters, for example narrow lateral ditches with vertical sides up to 90-120 cm deep are satisfactory in fibric materials but these measurements are unsuited to the more unstable aquatic organic materials, even when containing large amounts of wood (Plate 5). The stability of ditch banks and the protection of slopes can be improved by growing shrubs, low trees or deep rooting grass which will not grow under water and so not choke the ditches. Tall, top-heavy trees are unsuited because of problems of poor anchorage in peat. The problems of making ditches and preventing leakage through their sides when the outside water- table is higher than the water level in the drains are inherent in porous peats. They are mentioned here without further discussion as are the problems caused when making slopes and ditches by dumping relatively heavy, mineral soil material, taken from below the peat, on the soft spongy peat surface. These are problems of soil mechanics and hence outside the scope of this Bulletin. The clearing of vegetation is often difficult, and is another obstacle to reclamation. Unstable, wet surfaces with low bearing strengths make the use of bulldozers or tractors with winches impossible. Vegetation in tropical countries is commonly dominated by trees or thick brush (Plates 6 and 7), which is difficult to remove by hand. Clearing should be carefully programmed to avoid the clearance of too large an area at any one time as once drainage has been provided and vegetation removed the peat will start to decompose. Further, as the surface of peat dries the fire hazard increases. Clearance and drainage should never embrace more land than can be put to immediate use. Clearing involves the removal of trees, stumps and roots. Where large trees are present their stumps are very difficult to remove. The piling up and burning of cleared vegetation should be avoided but if necessary should only be done under carefully controlled conditions as a fire within the peat, once started, can carry on for months and may last a full dry season. Because of the large range of peat characteristics and the variety of conditions under which the swamps are reclaimed it is impossible to give full details of equipment that can be used. In developed areas, where the peat is drained and of high trafficability (bearing strength) and the vegetation is characterized by trees or shrubs of less than 5 cm diameter, tractors fitted with a front mounted bulldozer blade can be used to push down the vegetation. The land can then be turned over with a breaking plough (Lucas 1982). Generally, in developing countries the clearing and removal of vegetation is done entirely by hand. In countries with a pronounced dry season, the danger of starting fires in the peat necessitates the removal of coarse vegetation debris by stockpiling the stumps and leaving them to rot for a number of years. During a recent reclamation project in Brazil, the stockpiled wood was gradually removed for firewood by local settlers living on the periphery of the swamp. Such a practical use might be recommended where relatively small interior valleys are reclaimed by private companies and there is a shortage of firewood in the neighbouring already settled hills (Plate 8). Plate 7. 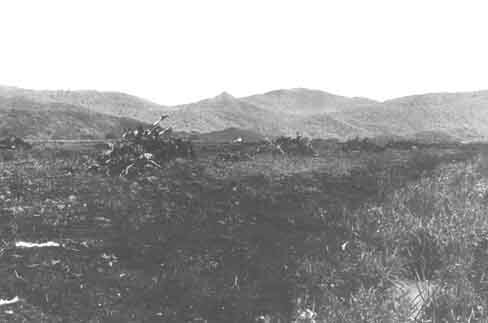 Bush vegetation of deep peat with initial clearing for drainage, Brazil. Plate 8. 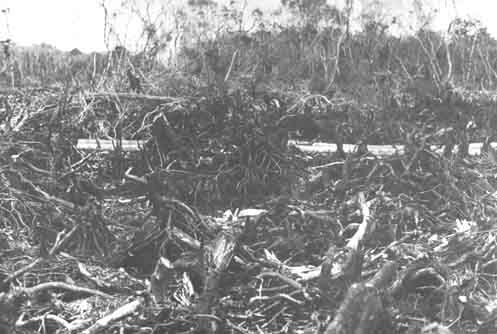 Piles of wood from the original vegetation left to decay in a lagoonal peat reclaimed for sugar cane, Brazil. Frequently surplus vegetation is disposed of by burning. This is traditional practice in peat reclamation by the local population in South East Asia. Apart from being a rapid way of removing the cut vegetation, the ashes improve the fertility of the peat in the initial years of cropping. In some localities, it also quickly disposes of the surface fibric layers, which are unsuitable for tillage. However, the fertilizing effect is quickly lost and common practice is either a reburn of peat or abandoning the area following a shifting cultivation pattern. Such frequent burns can lead to rapid lowering of the peat surface, but more directly, it can lead to intensive peat fires when not properly controlled. Usually, the local population are adept at preventing this but the danger lies with non-traditional farmers. These are commonly unacquainted with the local conditions and by copying the methods of the locals are unaware of making reclamation errors and thus create havoc by uncontrolled burns and too deep drainage. Controlling peat fires is extremely difficult. One method is to dig a drain around the fire down to the wet soil but compacting the peat by mechanical means is more effective. The use of high-pressure water, if available, is satisfactory when the fire is small. The removal of wood and roots, particularly if present in great quantities (Plate 9) is a time consuming and costly activity. Lucas (1982) indicates that the cost of clearing a woodland site may be 30 times more than the cost of a grass covered site. 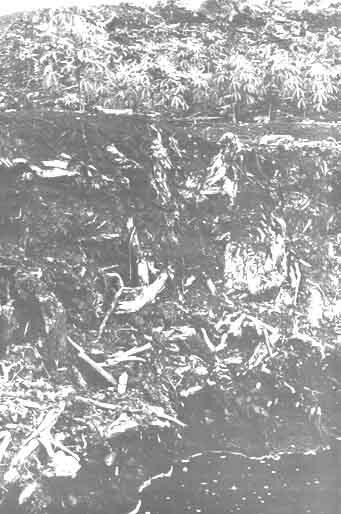 Most tropical peats are forested in their natural state and in some instances clearance may be uneconomic. It is general practice in South East Asian countries that the major drainage system for the initial phase of reclamation is developed by a Government Agency such as the Ministry of Public Works or a Drainage and Irrigation Department. Subsequent installation of field drainage systems and land clearance is accomplished by the settlers. These activities should be carried out according to a prepared blueprint under strict rules and regulations. Rapid settlement of peatswamps lacking a co-ordinated effort and planning can lead to disastrous results. Whereas Government-sponsored reclamation projects sometimes fail because of the lack of or only belated recognition of the erratic behaviour of peatswamps when reclaimed, the opposite may be experienced when autochthonous settlers, by tradition locally knowledgeable of the behaviour of their peats, initiate reclamations with success. The success of the reclamations by the local population is often because no use is made of machines and only shallow drainage is practised. Further, most reclamation is carried out on shallow peat bordering main rivers because here the problems are less than on deep peat. The behaviour of peat after drainage, and the problems this creates, is discussed in the following section. Subsidence or the lowering of the surface of reclaimed peat is undoubtedly the greatest problem when attempting to sustain agricultural activities. It is caused by changes in conditions brought about by drainage. Waterlogged and anaerobic peat in the natural swamp becomes aerobic when drained. The aerobic conditions lead to biological oxidation or mineralization of the organic deposits. Peat subsidence has several serious consequences. Drainage must be regularly adapted to new levels and conditions, otherwise inundation and flooding will recur. 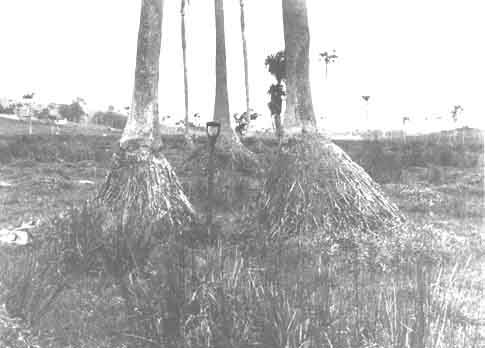 The rooting systems, particularly of perennial species become exposed (Plate 10), and top-heavy crops such as coconut palms and to a lesser degree oil palms start to lean over and are partly up-rooted (Plate 11). Roads and other structures become unstable, and as the drainage progressively breaks down, their surfaces become hummocky. Environmental effects will occur beyond the peatswamp confines; nutrient outflow will increase as the peat decomposes, and there will be an increase of CO2 released into the atmosphere. i. Processes causing the removal of organic materials: oxidation, burning, wind erosion and water erosion. ii. Processes causing consolidation of materials: compaction, shrinkage and dehydration. iii. Factors accelerating or influencing the processes mentioned under i. and ii. are: depth of drainage (height of water-table), character of the organic materials, the cropping system employed including irrigation, and the climate, particularly the temperature regime. iv. geological subsidence is an independent factor which would also play a role when artificial drainage was not provided. 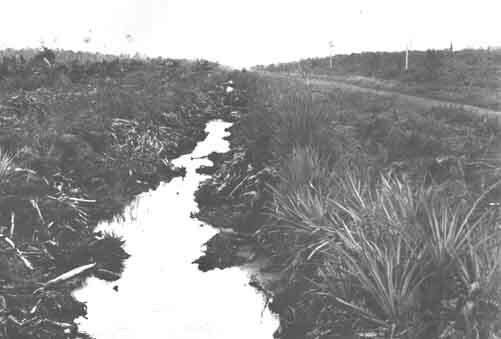 The subsidence of peat surfaces has been a problem ever since cultivators started to drain peat. There are long records of subsidence of reclaimed peats in both the Netherlands, where reclamation started between the 9th and 14th centuries (Schothorst 1977), and in the Fens of England where reclamation started in the 17th century (Darby 1956). Probably the best records on subsidence are available from the much more recent reclamation of the Everglades in Florida, USA, where subsidence has been monitored from the beginning in 1924 (Stephens 1956 and 1974; Stephens and Johnson 1951; Stephens and Speir 1969; Stephens et al. 1984). Reports on subsidence also come from Eastern Europe (Murashko 1969) and more recently from the tropical regions of South East Asia (Andriesse 1974; Driessen and Rochimah 1977; Driessen and Sudewo 1977) and Africa (Euroconsult 1984). Plate 11. 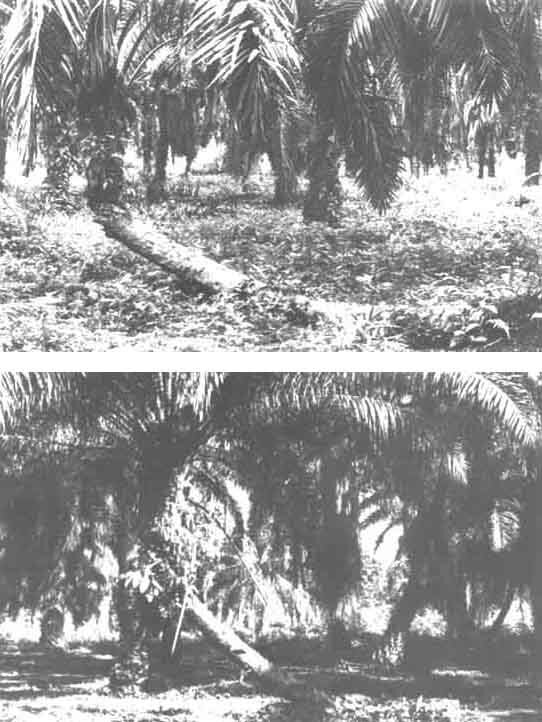 Palms leaning due to insufficient achorage after subsidence of deep peat, Sarawak, Malaysia. (Photo by Dept. of Agriculture, Sarawak). Worldwide subsidence rates vary from less than 1 to more than 8 cm per year. Whereas some peats in the Netherlands have subsided by only 2 m in about 1 000 years, peat in the Everglades (Florida) has subsided by 1.8 m in only 54 years (1924-1978). The organic soils of the Sacramento-San Joaquin delta of California subsided by 1.8 to 2 m in less than 30 years. Records on peat subsidence in South East Asia (lowland oligotrophic coastal peats) indicate 50 cm to 1 m in the initial years after reclamation with a subsequent decrease to less than 6 cm per year. Table 21 gives the reported rates of subsidence for sites worldwide. It is clear that there is a vast range in the rate of subsidence dependent on peat composition, drainage depth and history of reclamation. Figure 19 illustrates how in the Netherlands subsidence rate was influenced by a change from gravity drainage to pumping once the peat surface fell below the mean sea level. Energy initially supplied by windmills, followed by the use of steam pumps made it possible to keep the swamps dry. The rate of peat subsidence in the Netherlands was small compared with rates experienced elsewhere mainly because the depth of drainage was maintained through the centuries at only 20-50 cm for mainly pasture use. However with deeper and improved drainage (water-table control throughout the year) the yearly subsidence rate of 1.7 mm was accelerated to 6 mm. Field experiments indicate that a 40 cm draw down of the level in ditches over a period of 20 years resulted in a total surface subsidence of 23 cm. In the first two years the subsidence proceeded very rapidly, constituting 44 per cent of the total for the 20 year period, subsequently the subsidence rate decreased to a constant 7 mm per year. This initial rapid subsidence upon provision of drainage is noted in most countries. A knowledge of the expected subsidence rate is important in order to plan adaptations to the drainage system, estimate the lifetime of the organic soils, and assess the optimum land use. Subsidence rate is dependent on many factors, some of which can be changed and it is therefore necessary to discuss in detail the most important processes so that management plans can be developed which optimize the life expectancy of the peat deposits. Oxidation is generally taken to be the most important process causing loss of organic materials. Burning as a form of accelerated oxidation is mainly caused by man, and can be easily controlled or prevented. Water erosion and wind erosion are more difficult to control but are of little significance in tropical areas. Lucas (1982) reports from Canada that wind erosion has been one of the predominant causes of wastage, and losses of over 3 cm are noted during severe storms. The removal of peat by scouring in drainage channels, is locally important and coastal erosion occurs where peat is exposed on the shore (Andriesse 1974). In the tropics however none of these forms of peat removal compares with oxidation in lowering the surface level. Oxidation is a biochemical process intensively studied by Waksman and Stevens (1929) and Waksman and Purvis (1932). In laboratory studies they found different rates of decomposition in peats of different chemical composition and in peats containing different micro-flora and micro-organisms. Samples of Florida low moorpeat were decomposed by 15 percent at 28°C in 18 months under optimum moisture conditions of 50-80 percent. Above and below this moisture range, decomposition rates rapidly diminish. Wet and dry cycles also appear to stimulate decomposition. Bacteria are commonly most numerous in drained low moor peats and less numerous in highly acid high moor peat. However, when the latter are limed, manured, and cultivated, microbial populations increase to about the same as low moor peat under similar drainage conditions, and decomposition rates increase likewise. Organisms responsible for decomposition are most active above 5°C. Soil microbial activity generally doubles for each 10 degree increase in temperature and soil temperature is therefore an important factor in determining subsidence rates, particularly for tropical areas where temperatures remain in the 25-30°C range. Depth of drainage is another important factor governing the rate of oxidation and it was studied by Schothorst (1977) in the Netherlands. Stephens and Stewart (1977) developed a mathematical model linking drainage depth and soil temperature that could be used to estimate subsidence of low moor peat in different climates. Figures 20 and 21 give the results of these studies; Figure 20 indicates the strong correlation between subsidence rate and average depth of the water-table, and Figure 21 depicts the relationship between expected annual subsidence with the two main variables soil temperature and depth of drainage. The latter graph is based on the mathematical model which was developed for organic soils with a mineral content of less than 15 percent and bulk density of approximately 0.22 g/cm3. Muck soils with higher mineral content and bulk density, will have subsidence rates between one-half and three-quarters of those shown on the graph. The model is only tentative and based on limited field and laboratory data, but, in the absence of empirical information, can be used to quantify subsidence caused by mineralization. Details of the model are given in Appendix 4. Figure 20. Rate of subsidence compared with water-table depth for organic soils in Indiana, Florida Everglades and the Netherlands. The two Netherlands lines show total subsidence and subsidence attributable to biological oxidation. i. shrinkage due to physical processes. The withdrawal of moisture from the surface layers by evapotranspiration may cause high moisture tensions in the root zone resulting in a decrease in volume of those layers (above the phreatic surface). ii. Oxidation through biochemical processes as explained above. iii. Consolidation or compression due to a mechanical process. When the groundwater level is lowered, the buoyant force of water is lost in the upper layers. The deeper layers then have to bear an increased weight of 1 g per cm2 per cm of draw down of the groundwater-table. This causes compression by the soil layers below the phreatic surface. Consolidation is often divided into a primary phase and a secular phase. The former is largely a function of the rate of water escape from and through the peat mass. This can be very high in the initial phases of drainage because of the high permeability of raw peat. When permeability decreases as a result of consolidation the primary hydrodynamic phase becomes almost constant. Secular consolidation continues long after the primary phase has stopped to play its initial important role and may in the end account for half the total loss in volume. It was previously generally assumed in the Netherlands that the decreasing volume of peat above the water-table was controlled more by shrinkage and compression than by oxidation. This was the case because of the ubiquitous grass cover. Schothorst, however, found that 20 percent of the subsidence could be ascribed to irreversible shrinkage, 28 percent to compression (subject to elastic rebound and recovery) and 52 percent to oxidation. These results are in agreement with the general findings elsewhere that oxidation is the main cause for soil subsidence. It is important to note that compression and irreversible shrinkage will gradually decrease from an initial peak but that oxidation of organic materials will continue at a more or less constant rate until a new lowering of the water levels in ditches is necessary. This corroborates previously mentioned findings in tropical countries. Bouman and Driessen (1985) argue that the subsidence after drainage or reclamation is the sum of the effects of settling, shrinkage and mineralization. For this reason the mathematical model developed by Stephens and Stewart (1977) to estimate subsidence is only valid for the mineralization component, because it disregards the effects of shrinkage and compaction. They prefer to employ two models to predict overall subsidence for tropical areas by fusing the Stephens-Stewart model for the mineralization component and the Murashko equation (Murashko 1969, Appendix 4) for the consolidation component independent of climate. By adding the two, total subsidence under tropical conditions can then be approximated. Figures 22 and 23 give the total subsidence thus computed for an imaginary tropical peat over 20 years of drainage in relation to bulk and particle densities, and initial drainage depth respectively. Figure 24 indicates the computed partial subsidence rates for consolidation and mineralization. This shows the considerable influence of consolidation on subsidence in the initial years and the long term effects of continued mineralization. A comparison of subsidence rate under sugar cane, vegetables and pasture, using a given water-table depth, showed the annual rate of subsidence under sugar cane to be about 30 percent less than under pasture or vegetable crops (Snyder et al. 1978). Though in previous studies no conclusive evidence is available to show that the type of crop has a direct bearing on subsidence rate. Indirect effects are probably much more significant. Each crop has an optimum water-table level dependent on rooting habits, resistance to drought and wetness. Climatic conditions; rainfall, wind, evaporation and temperature are important parameters for calculating water requirements. Table 22 shows the minimum optimum depth of water-tables for a range of vegetable crops grown on various peats in the USA and England (Snyder et al. 1978). The range is large and varies from 30 to 90 cm depth. Sugar cane grown in the Everglades in Florida requires a water-table at 75-90 cm depth for optimum growth and quality but in experiments it was found that with a water-table at 38 cm depth the crop produced only 5 percent less sugar than the best yields obtained with a water-table at 75 cm depth. For one variety the best yields were obtained with a water-table at 38 cm depth. In the Netherlands water-tables under grassland are usually maintained at between 30 and 50 cm depth which produces much smaller rates of subsidence than if crops requiring a much lower water-table are grown. A large subsidence rate will be experienced in tropical regions where tree crops are to be grown with extensive, deep rooting systems which demand deep drainage. Depth of drainage influences the rate of subsidence and therefore choice of crop or land use is indirectly related to the rate of subsidence. A system of raised beds in conjunction with higher water-tables could be used to extend the life of peat deposits. Figure 25 demonstrates this and shows how two crops can be grown in adjacent rows each with an optimum depth of water-table. However, the system may be short lived if decomposition of the peat on the ridges is faster than in the drains. Although the system is successfully practised by Japanese farmers in Brazil (Plate 1) they do not grow a crop in the furrow. The high acidity and low levels of plant nutrients in peat demands the use of lime and fertilizer for crop growth. The change from oligotrophic to more eutrophic conditions as a result of fertilization changes the microbial activity and hence the rate of mineralization (Chapter 4; section 4.3). The use of fertilizers therefore tends to accelerate decomposition. However, McGreevy and Farrell (1984) found in incubation experiments few lasting effects in ombrotrophic peats after an initial stimulation. In reed-swamp peat, decomposition was even reduced by liming to pH 6.5. General statements on the effect of liming are therefore dangerous as there are other factors to be considered. The dilemma of using fertilizers or not can be illustrated by the following example. Schothorst (1977) records studies in the Netherlands on the improvement of gross yield of grass through deeper drainage. The improvement could be attributed to the availability of more nitrogen as a result of the decomposition of peat to a greater depth. The deficiency in nitrogen occurring in grassland with shallow drains can also be corrected by more costly N-fertilization. The choice between either deeper drainage with its risk of accelerated subsidence or the use of costly N-fertilizer is often difficult. The cropping system influences the amount of compaction of the soil surface. The regular harvesting of intensively grown vegetables, particularly if heavy machinery is used, makes heavy demands on surface structure and consistency. Where annual crops are grown there are often short fallow periods. The surface temperature in these exposed peats can reach 70°C in the tropics as peat is a very poor conductor of heat. As well as encouraging the formation of desiccated hydrophobic granules (coffee grounds) or dust, this also increases the rate of oxidation. Bare peat surfaces, low humidity and high temperatures can lead to spontaneous peat fires. A permanent groundcover would prevent this. 1 Eight water-table treatments: 75 cm with overhead spray, 30, 53, 75, 100, 120 cm, fluctuating, 120 cm with overhead spray (the experiment was replicated). 2 Three water-table levels, two replications, 40, 70 95 cm. 3 Water-tables ranged from 25 to 95 cm (unreplicated). 4 Five water-table depth treatments: 30, 60, 90, 120, 150 cm (unreplicated). 5 No data have been found on these crops, and depths given are estimates under average Everglade conditions. The success of agriculture on peat soils depends on the choice of land use. This choice dictates the required drainage depth though in some localities the water levels in peatswamps are governed by the needs of peripheral areas. The cropping systems in common use today inevitably cause some subsidence. There is a wealth of historical evidence that once drainage has started subsidence commences and unless the swamps are inundated again the peat will eventually disappear. Radio-carbon studies have indicated that 30 cm of peat which took 400 years to develop can easily be destroyed in less than 10 years because of injudicious drainage. The rate of subsidence can, however, be regulated and slowed down by proper water control and good land management. The careful choice of crop is the best way by which the rate of subsidence can be minimized. There should be continued collaboration between drainage engineers and agricultural scientists to look for optimum ways of controlling the subsidence of peat by appropriate water, land and crop management. The search for new crops or new varieties to be grown profitably in more waterlogged conditions and a continuation of the work into the water-table requirement of crops should be major parts of the research programmes aimed at improving the management of reclaimed peatswamps. In the tropics there is little locally gathered data on the water management requirements in relation to widely grown crops. Traditionally the emphasis has been on the short term problems of fertilizer requirements rather than on water-control measures, which are more important in the long run. It is difficult to set up satisfactory experiments to look into the optimum depths of the groundwater-table for specific crops. The following serves as an example: expensive and comprehensive water-table studies have been carried out in the Everglades in Florida since 1958 (Harrison et al. 1963), but they have proved unsatisfactory. It is difficult, even when using intricate designs, to maintain a range of pre-determined water-tables in plots arranged in a 3 x 3 Latin square on a 24 acre block. Subsequent studies have shown that the drainage of the peats overlying limestone is considerably affected by sub-surface flows through the peat-rock interface (Casselman and Green 1972). Mole drainage appears to have little effect on these flows along the interface. Piling the plots or building concrete walls down to the more or less impermeable subsoil have to be established, but even then hydraulic pressure from high water-tables in neighbouring parcels influence the plots with lower water-tables. In the absence of reliable tropical field studies and taking into consideration the difficulties encountered elsewhere, the alternative is to use lysimeters. These concrete tanks, if built of about 150 x 300 x 150 cm size, can each be used for 3 separate plots of 150 x 100 cm size for crop studies. When filled with organic soil water-tables are maintained by an exterior water levelling container connected by a 1 cm internal diameter plastic pipe. Water-levels in the levelling container are maintained by a valve with holes in the container immediately above the desired water level for overflow. Holes should be drilled into the concrete tanks at the soil surface level to allow surface drainage (Pate and Snyder 1979).